The use of available capacities and the improvement of operations are important issues in parking management. The daily degree of occupancy and the distribution of the individual parking time over the day/week are only two aspects which play an important role in this context. The V-REX PARKING system is based on automatic number plate recognition (ANPR) and is capable of generating all kinds of statistics. This applies to chargeable parking (e.g. with barrier gate) as well as parking free of charge. 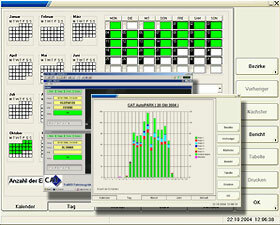 The system provides the opportunity to determine the frequency of costumers visiting a center (e.g. weekly or monthly visits). 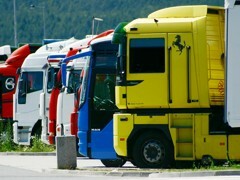 In some cases it is also possible to make conclusions about the customer's point of origin. Due to the tremendous increase of heavy goods vehicle (HGV) traffic it has become a necessity to monitor the changes in traffic volumes and especially analyze usage of motorway truck parks. 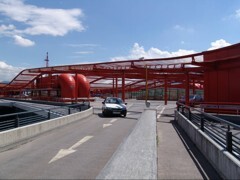 For this purpose semi-stationary systems are installed at the ramps of truck parking area. The V-REX systems in use have integrated radar sensors for truck/car classification in order to provide accurate data (length of stay, frequency of use, occupancy, etc.) for truck traffic, separately.